The House was set to debate a bill that would scrap a 27-year-old law mandating a 22-to-1 student-teacher ratio in kindergarten through fourth grade today — but before it got the chance, state Rep. Borris Miles, D-Houston, derailed the legislation with a point of order. HB 400 from state Rep. Rob Eissler, R-Woodlands, would replace that ratio with a hard cap of 25 students per classroom. Miles challenged the bill because the analysis did not match up with the text of the bill. It now returns to the Public Education Committee, which Eissler chairs, which must pass it out once again. It could hit the House floor for the second time as early as Friday. In an interview after his point of order was sustained, Miles called eliminating the class size ration "ridiculous" and said that it pitted teachers against administrators. He said that when it returned to the floor, he would continue to challenge it. "There's other points of order on HB 400 that need to be addressed," he said. Outside the House chambers, Eissler emphasized that his bill was about protecting teachers' jobs and expressed frustration that it had been delayed on a technicality. "We're in the cat-and-mouse game now; that should tell you how badly they don't want this to pass," he said. In 1984, the Legislature passed an extensive school reform package, which included a requirement that prohibited schools from going above a 22-to-1 student-to-teacher ratio in elementary grades. Teachers associations have fought hard to keep that in place, saying the detriment to students' educational experience that removing the ratio would bring isn't worth what they believe will be a marginal benefit. They also question whether it would actually help reduce costs. Districts can already apply for a waiver if they lack the space or qualified teachers to create a new class — and they say the Texas Education Agency already grants the vast majority of such requests. Eissler's bill also contains provisions that eliminate minimum salary requirements for teachers, authorizes unpaid furloughs and removes the 30-day period for districts to notify teachers of their termination. It also scraps the 10-to-1 student teacher ratio for remedial classes. In the upper chamber, state Sen. Dan Patrick, R-Houston, has similar legislation pending in committee. SB 443 changes the 22-to-1 class size cap to a 21-to-1 district-wide average. But it prohibits districts from having any class sizes larger than 24 — and does not provide a waiver. Raymund Paredes: $10,000 Degrees "Entirely Feasible"
At a board meeting of the Texas Higher Education Coordinating Board on Wednesday, Higher Education Commissioner Raymund Paredes said that $10,000 bachelor's degrees — books included — as proposed by Gov. Rick Perry are "entirely feasible." He hopes to have concrete proposals and coursework in place to meet the challenge before the start of the next legislative session in 2013. A repeated theme in the board's discussion about the governor's cost-cutting proposal was that they were not seeking to replace existing degrees or artificially push the costs of those down, but were rather seeking to provide alternative options for low-income students. "We're not talking about every field," Paredes said. "We're not talking about every baccalaureate degree. We're not talking about every student." Van Davis, special projects coordinator for the coordinating board said that all low-cost degree programs would have to share certain characteristics. They would have to be rigorous, highly structured, allow for advancement based on proven competency levels, leverage technology, and have buy-in from faculty members. "Low cost does not equate to low rigor or even low value," Davis said. A key to reaching the goal will be leveraging existing resources, such as online degree programs and open source textbooks. "Our institutions are already doing so many pieces of this," Davis said, noting that it was largely a matter of putting those pieces together in the right way. Deputy Commissioner David Gardner said that communication between the coordinating board and institutions of higher education on developing the low-cost degrees was still in its nascent stages. Board Chairman Fred Heldenfels said that one of the biggest challenges would be skepticism from others. HAs soon as Perry announced the challenge in his State of the State adress, Heldenfels said he heard at least one university system head and two state representatives question the plausibility of a $10,000 degree. Perry advisor David Young told the board to remember that reaching $10,000 is a challenge, as opposed to a directive. "If we don't hit $10,000 right on the mark, at least we can make some progress," he said. As more middle class families choose alternatives to California's private schools, public schools are being affected. Continuing reductions in education budgets in California are increasingly sending middle class parents to explore alternative arrangements, the Mercury News reports. With the shortening of the school year, increase in class sizes and program cuts at public schools, some private schools are seeing record applications this year. Calvary Christian Academy in San Jose, even plans to reopen this August because of the increased demand after closing its doors several years ago. After a decade of falling enrollment, in part due to the bursting of the internet bubble and a general economic downturn, interest in private education seems to be on the rise. Some schools are reporting a 25% rise in applications. Harry McKay, head of the School at St. Andrew’s Episcopal in Saratoga, said 40% more people applied or inquired about applying this year than the last. Although this year’s statewide private school enrollment numbers are only 8% compared with 10% in 2001, counties like Santa Clara report that the number of public school students is growing at a slower rate than the population growth since the 2000s. According to the article, California parents have traditionally preferred public education for their kids while also supporting increased taxes and bonds to fund it. However, if the trend is reversing, this could have a devastating social, economic and political effects on the state, says UCLA professor Gary Orfield. Last Tuesday, at a public hearing on the teacher furloughs next year, more San Jose United parents threatened to withdraw from public schools if the district increased the class sizes. That’s not what the district wants to do, spokeswoman Karen Fuqua said. If parents would invest the private tuition they pay — from $5,000 to $30,000 a year — in the district instead, class sizes wouldn’t have to be raised, she said. Press Release, "Education Leaders: Delaying End-of-Course Exams Fails Students Implementing Existing Education Reforms Will Not Drive Costs," put out by the Texas Institute for Education Reform promoting HB 3's heightened use of high-stakes, end-of-course exams. Shouldn't be surprising given the individuals endorsing this proposal all have an economic stake in the state's testing consumption. 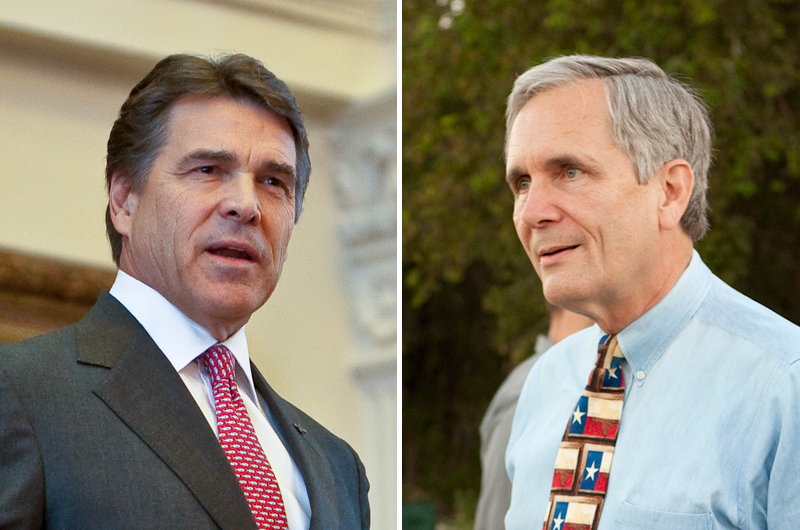 Governor's higher ed reform campaign undermines UT and Texas A&M standing. In Houston, we are familiar with and strongly support the University of Houston's advancing campaign to achieve Tier 1 status as a major research university. There are only three such schools in Texas at present: the University of Texas at Austin and Texas A&M at College Station (both public institutions), as well as our city's private Rice University. The state Legislature thought enough of the goal to create more Texas top-tier institutions that it created a dedicated fund to aid schools in boosting their research capacities. Yet there's a place in Austin where that effort seems to have been turned on its head: the office of Gov. Rick Perry. By most academic standards the state's two flagship public universities are doing just fine. Their graduation rates are well ahead of the state average, and their national rankings are extremely high for state-supported institutions: U.S. News and World Report pegged UT 45th in the country and A&M 63rd among all national universities. Not only are they not broken, the schools reside on a very high academic pedestal. Yet the governor, latching onto the rather eccentric educational philosophies of a major campaign contributor, businessman Jeff Sandefer, has pressed his appointees among the regents of UT and Texas A&M to institute so-called reforms outlined in Sandefer's "Seven Breakthrough Solutions." It's an agenda pushed by the conservative Texas Public Policy Foundation, of which Sandefer is a board member. Among Sandefer's ideas: rating professors based on the number of students they teach and evaluations by students, separating teaching and research budgets and establishing a Texas-based accreditation system for public universities. The governor held a summit in 2008 in Austin for regents where Sandefer made a presentation. Although Perry claimed the purpose was simply to discuss educational ideas, subsequent emails from the governor's staff to regents made it clear they were expected to swiftly enact Sandefer's concepts. Texas A&M Chancellor Mike Mc-Kinney already stirred up an academic fracas by implementing several of the reforms, such as listing the amount of revenue professors generated through teaching and research and rewarding those who got good student evaluations. The Association of American Universities, which represents major research institutions, criticized the measures as academically unsound, as did many A&M professors. That was a prelude to the recent debacle resulting from the hiring of Rick O'Donnell, a $200,000 a year special adviser brought in by UT regents Chairman Gene Powell. O'Donnell, as a research fellow for Sandefer's foundation, authored reports claiming much of university research is of questionable value and that teaching and research functions should be separated. 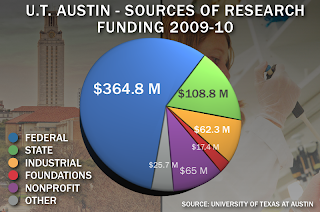 One of his papers, "Is Academic Research a Good Investment for Texas?" turned out to be rife with errors, and in the ensuing flap O'Donnell was reassigned to another position. Last week, UT fired O'Donnell after he wrote a letter to a regent accusing top school officials of suppressing data that he claimed showed growing school resources going to professors who did little teaching. A UT spokesman denied the claim, saying that the data is still being compiled and would be presented to the regents. This academic soap opera need never have happened, and is an illustration of the continuing negative consequences of elected officials injecting politics into the administration of our priceless research institutions. Gov. Perry, stop messing with UT and Texas A&M. Hmm... So Berman's argument, “Why spend almost half a billion dollars for tests that won’t count for anything?” should raise some concerns for the simple fact that it highlight just how much money (in direct costs) are being put into the pockets of testing companies. AUSTIN — The Texas House, responding to pleas from worried school districts, voted Wednesday to ease up on tough new testing and graduation requirements for high school students. Although critics said the House bill was a major retreat from strengthening academic expectations, most members voted to pass the legislation, which would allow students to fail as many as eight of 12 new end-of-course exams and still earn a diploma. Tentative approval came on a voice vote, with final action scheduled for Thursday. The measure, which faces a hostile reception in the Senate, also would scrap a requirement that the end-of-course exams count as 15 percent of a student’s final grade in each of the 12 courses. Instead, school districts would be allowed to decide whether to count the test scores in grades. Incoming high school freshmen this fall will be the first group of students subject to the new tests. House Public Education Committee Chairman Rob Eissler, R-The Woodlands, author of the bill, rejected complaints that it represents a step back on school improvement efforts, insisting it “does not lower standards” in Texas schools. He also said there is strong public support for reducing the amount of testing in schools. “We all hear from parents and teachers that schools are more focused on testing than learning. Time and again we hear complaints about drill and kill [on test preparation] in Texas classrooms,” he said. Eissler said the measure “creates a clear, easily understandable path to graduation in Texas” unlike the current law. The rules now require students to get passing averages on the three exams in each subject area — English, math, science and social studies. Smith said Texas has been recognized nationally for setting such high standards for schools, including the new end-of-course exams for high school students. Smith also said while school districts are worried about large numbers of their students failing the new exams, the commissioner of education will have authority, as he has had in the past, to adjust passing scores if the exams prove too difficult for most students. Rep. Leo Berman, R-Tyler, who also opposed the bill, said end-of-course tests that have cost the state millions of dollars to develop would become almost meaningless under the legislation. “Why spend almost half a billion dollars for tests that won’t count for anything?” he asked, noting money spent on the high number of tests that could be failed without consequences. Eissler said students would still have to pass their courses to graduate and that school districts would have authority to include scores on the tests in final grades. “It’s a matter of letting local school districts make these decisions. We’re trying to get the state out of micromanaging school districts,” he said. While Senate Education Committee Chairwoman Florence Shapiro, R-Plano, and other Senate leaders have voiced opposition to backing off on the new testing program — originally approved in 2007 — Eissler said times have changed and many school districts are looking at sizable funding reductions next year. Under the 2007 testing law, high school students will have to take three exams each in English, math, science and social studies — a total of 12 tests. The law calls on students to achieve a passing average on the three tests in each subject to earn a high school diploma. Field testing of the new exams has found large numbers of students lacking the skills to pass. Under the House bill approved Wednesday, students would have to pass only the English III and Algebra II exams, and one test each in science and social studies. In addition, the measure sets up a new two-year transition that would allow students for the next two years to take the outgoing and much easier TAKS exam in lieu of the end-of-course tests. The House bill has drawn fire from the Governor’s Business Council, Texas Association of Business, Texas Institute for Education Reform and former President George W. Bush’s education adviser, Sandy Kress. All said the House bill would undermine recent academic improvements in the state. Final House approval is expected Thursday or Friday, before the bill is sent to the Senate, where leaders have said they don’t want to retreat on the new testing and graduation requirements. AUSTIN — The Texas House tentatively approved a bill Wednesday to make it easier for high school students to pass end-of-course exams — a move critics called “a substantial retreat” from school accountability. “This bill creates a clear, understandable path to graduation,” House Public Education Chair Rob Eissler, R-The Woodlands, said of his legislation, HB 500.
Business and education reform groups complained the bill would weaken efforts to ensure all high school graduates are college- or career-ready. Some legislators also used the debate to blast the entire testing issue and reliance on standardized tests to measure student achievement. The House will take a final vote on the bill today before it moves to the Senate, where it is unlikely to get a friendly reception. Senate Public Education Chair Florence Shapiro, R-Plano, has repeatedly expressed opposition to diluting end-of-course testing. Two years ago, lawmakers approved HB 3, replacing the Texas Assessment of Knowledge and Skills with end-of-course exams for high school students. Under that bill, starting in the 2011-12 school year, students are to take 12 end-of-course exams in math, science, social studies and English language arts. They must earn a minimum score to be determined by the state commissioner of education. Under Eissler's bill, students would have to pass only four end-of-course exams — in English, algebra, science and social studies — to earn a diploma. He said the changes would dilute the state's incremental upgrading of accountability standards, designed to produce high school graduates who are college-ready. HB 500 also directs the Texas Education Agency not to use projected improvement in school accountability ratings, which cast doubt on last year's ratings. Projections are appropriate to set expectations but not for measuring actual student improvement, Rep. Scott Hochberg, D-Houston, said before getting unanimous support for his amendment. Hochberg also won easy approval for an amendment creating a pilot program to exempt students from a standardized test if they passed it the previous year. “If we know they're going to pass that test, why give it to them?” he asked. It would be better for schools to concentrate time and effort on struggling students, Hochberg said. Lawmakers also unanimously approved HB 6, which would replace the system of funding textbooks and instructional materials with a new “instructional materials allotment,” including books, computer software, magnetic media, DVDs, CD-ROMs and computer courseware. This piece needs to be clear when it say's "education reform groups," and acknowledge (as was done during the hearing) that members of these "reform groups" are also closely tied to the testing companies that benefit from our testing obsession. Changing the use of high-stakes testing does not mean that students will still be required to complete the curriculum. In fact, there is no research that supports the ways in which Texas place high-stakes testing requirements on students. Rather, experts would argue that it's a misuse of the tests, which are developed for diagnostic purposes only. This is such an old debate that is kept alive by the interests that benefit. Measure would allow students to pass fewer end-of-course exams to graduate. Texas high school students would have to pass fewer new state exams to graduate under a bill to be considered today by the Texas House. Pushed by state Rep. Rob Eissler, chairman of the Public Education Committee, the bill aims to ease the transition to tougher end-of-course exams. But business and education reform groups say it is a step backward, and they blame school districts for using the state's budget crisis to justify undoing a law they don't like. Current law sets as a graduation requirement that students take a total of 12 end-of-course exams — in English, math, science and social studies — and earn an average passing score within each subject. Incoming freshmen would be the first students to face the more stringent requirement, which was passed in 2009. House Bill 500 would loosen those requirements and allow a student to graduate by passing four exams: algebra and English III as well as one from each of the other two subject areas. Eissler, R-The Woodlands, said the bill would give students more time to ease into the tougher new exams and simplifies the requirements. "We're not letting up. I think we're being more direct and more fair," Eissler said. Business leaders and education reform groups have said the proposed looser requirements would weaken the expectations for graduation, making a high school diploma little more than a piece of paper. Drew Scheberle, vice president for education at the Greater Austin Chamber of Commerce, said HB 500 takes the state in the wrong direction. "It reduces the amount of information you need to demonstrate knowledge on to earn a diploma. This isn't a transition; it's an absolute lowering," Scheberle said. And the people who will suffer from the lowering of those standards will be the students, he said . "If HB 500 passes, there are no repercussions until the kid hits college or the real world academically unprepared," Scheberle added. More than 125 other House members have signed on to the measure, so chances are good that HB 500 will clear the House. But its fate is murkier in the Senate. Education Committee Chairwoman Florence Shapiro, R-Plano , has said that she does not want to backslide on education reforms that have been years in the making. Consequently, Shapiro pushed to include almost $400 million in the Senate version of the budget to pay for textbooks and other instructional materials needed to prepare students for the exams. The House budget, however, does not have money for those materials and reduces school aid by almost $8 billion in the next two years. School districts have seized on the state's budget crisis to justify this change, said Bill Hammond, president of the Texas Association of Business. But he said the districts' real worry is that student performance on the field tests of the end-of-course exams has been troubling. "They want to take advantage of the financial situation and delay the onslaught of reality," Hammond said. Eissler denies that this change is related to the state's budget situation. But state Rep. Mark Strama, D-Austin, said the budget crisis has put in jeopardy money for programs and materials that schools need to prepare their students for the exams. "Their request for getting the Legislature's foot off their necks in the accountability system has some resonance with me," said Strama, a member of the Public Education Committee. What has been lost in this debate, Strama said, is that the exams are supposed to be used to identify students who are struggling and get them the help to pass the tests. "The accountability system shouldn't be a Damoclean sword hanging over the heads of schools," Strama said. Of course individuals with strong ties to the very testing company that benefits from schools and districts' over-consumption of high-stakes testing would put this out. They belong to the small number (count them on one hand) of individuals that are opposed to HB 500. The current Texas legislative session is largely about the budget crisis, and the media reports have particularly sensationalized the potential cuts in public education funding. But if one looks more closely, there is a larger threat in public education policy, one that would undermine much of the progress we have made in standards and accountability. Let's retrace why the recent Texas public education reforms were necessary and why the Legislature spent so much time and effort crafting them. Prior to the adoption of the landmark House Bill 3 in 2009, we needed a more rigorous high school curriculum with serious and focused assessment and accountability. Among other provisions, these reforms called for the end of the dreaded TAKS exit exam in high school, to be replaced with end-of-course exams in the 12 core high school subjects. This was a big step forward because these exams could be used as finals, total testing time would be reduced and instruction could be devoted entirely to the curriculum instead of teaching to an unrelated test. Educators, parents and students would take these courses and exams seriously because the exams would count as 15 percent of course grades. This means that for the first time, after HB 3 is fully implemented, postsecondary readiness, defined as college and workplace readiness without the need for remediation, will be the organizing principle of the Texas school accountability system. In addition, it means that we have adopted a postsecondary ramp, with benchmarks for achievement at every grade level and vertically aligned assessments that tell us where every child is on that ramp leading to the postsecondary readiness standard as the exit. We have been on a journey leading to this standard and these expectations for our students and our educators for more than a decade. With the adoption of HB 3 in 2009, we are there. These reforms increased focus on quality instruction, eliminated time spent teaching to an unrelated test and the assessments mattered in students' grades, providing great hope to getting students more prepared for college or a meaningful career. This was a very big deal, a stop-the-presses moment in reform. In fact, Achieve Inc., a national consortium of business and education leaders, named Texas as the only state that met all of its criteria for college- and career-readiness graduation standards. Now a series of proposals in the current session, primarily House Bill 500 recently passed by the House, threaten to roll back much of that progress, to revisit the old HB 3 debates, to refight the last war. • End-of-course high school exams will not count as part of the student's grade in the course. • Graduation standards will be lowered so that students will be able to fail as many as eight of the 12 end-of-course exams and still receive a high school diploma. This means a student would have no motivation whatsoever to take seriously English I or II, geometry, two of the science exams and two of the social studies exams. Many would like to do away with state testing in the interest of local control or delay implementing end-of-course exams on a hollow argument about costs. But if reliability of funding for instructional and curriculum materials is the issue here, we should have that discussion. You will find that our coalition fully supports the necessary funding for the implementation of HB 3 on schedule, including the end-of-course exams, and I cannot conceive of legislators leaving town without fully funding the instructional materials our students need to begin the next school year. And we support the principle of local control as it pertains to the concept of full operational authority commensurate with responsibility, but accountability standards should be a matter of state policy. We also support the maintenance of funding that provides intervention to support remedial initiatives in the schools for those students who need it. But we shouldn't allow the budget crunch to be a red herring in delaying the full implementation of these enhanced standards and altering the ultimate mission of public education. And we shouldn't allow the mantra of local control to undermine the most rigorous high school graduation standards in the nation that have put Texas back at the top in our expectations for our educators and our kids. Windham is chairman of the Texas Institute for Education Reform. AUSTIN (KXAN) - Education Commissioner Robert Scott ended the use of the controversial Texas Projection Measure on Friday, and the impact of his decision on Austin-area school district ratings is still hard to determine. The Austin Independent School District, like many across the state, benefited from the Texas Projection Measure last year. More than half the school districts in Texas saw their ratings boosted because of it, along with thousands of school campuses. The accountability system's newly incorporated measure , requested by lawmakers and created by the Texas Education Agency, bumped up ratings based upon a statistical model’s prediction of how well students would do on the next year’s state-mandated test. That raised a lot of doubts in the public about the soundness of the measure, which the elimination of TPM now addresses. "The commissioner made the right call," said Greater Austin Chamber of Commerce senior vice president Drew Scheberle. "Elimination of TPM will restore the credibility of the Texas accountability system. Business people throughout the region had a hard time believing that students who fail the TAKS test but might pass some time in the next three years should be counted as passing." How significant was the impact of eliminating TPM? Well, if you go to the Texas Education Agency's accountability website and type in the name of your school district, it appears more than two-dozen campuses in Austin benefited from TPM, along with more than a dozen campuses in the Round Rock school district and four campuses in San Marcos CISD. Here are a number of area campuses that have higher ratings, in all or part, due to a boost from TPM: Austin and Bowie high schools in Austin ISD, along with Kealing Middle School; Westwood, McNeil and Stony Point high schools in Round Rock ISD; Lake Travis High School and Hudson Bend Middle School in Lake Travis ISD: and Bowie Elementary and Miller Middle School in San Marcos CISD. The commissioner, along with a focus group and an advisory committee, makes key decisions about changes in the state’s accountability system each year, such as the percentage passing required to qualify for each rating category. In his annual announcement on Friday, Scott chose to toss out TPM after some scathing reviews from key lawmaker Rep. Scott Hochberg, D-Houston, and a unanimous vote in the House to end the use of TPM as part of House Bill 500. Scott wrote, in his decision document released on Friday, that such criticism of the TPM detracted from actual gains in student test scores, which showed growth in every subject and every student group. Scott called the TPM sound and statistically valid after a year of use, comparing it to the methodology behind SAT and ACT tests, but lawmakers such as Hochberg had doubts. Scott's own children attend Bowie High School, and he told reporters he thought no less of the school's quality and achievement because TPM had bumped the campus from "academically acceptable" to "recognized." To many lawmakers and parents, however, the decision to base better ratings on a statistical model that predicted what students might do one or two years down the road was questionable, and the model’s reliability grew fuzzier and less accurate the closer the scores drew to the passing score. Criticism of the TPM was no more than political rhetoric seized by Democrat Bill White’s campaign for governor last year, Scott has told numerous audiences. The vote to end TPM, however, was bipartisan and unanimous in the House. The agency has no firm predictions about what the future, minus TPM, might hold. New school and district ratings, based on this spring’s test scores, will be released at the end of July. Agency spokeswoman Debbie Ratcliffe did predict that the exclusion of the projection measure would probably have the greatest impact on those campuses that had moved from “recognized” to “exemplary” with the use of TPM, even more than those that moved from "academically acceptable" to "recognized." Just because TPM is gone doesn't mean growth measures are out. A new growth will have to be incorporated when the state starts its new STAAR testing system . In fact, the state will not be issuing accountablity ratings in 2012, waiting until 2013 to break in the new ratings system. This Texas discussion on college ready standards, the use of high-stakes, end-of-course exams, and budget constraints is important on a national level, especially among those states (and districts) that signed on to national common core standards. The Texas case study once again leads the nation on educational policy in practice. When Representative Rob Eissler, Republican of The Woodlands, brought House Bill 500 to the Texas House floor on April 6, he emphasized what it did not do. Mr. Eissler was setting out to correct what he called the “misrepresentations” and “false claims” surrounding the bill, which, despite its overwhelming support in the House — more than two-thirds of his colleagues signed on to it, and only five voted against it — has generated vocal opposition from some within education circles who view it as a dramatic retreat from hard-won reforms. The bill also reveals a divergence between the Legislature’s two public education chiefs — Mr. Eissler, who heads the House Public Education Committee, and his counterpart in the upper chamber, Senator Florence Shapiro, Republican of Plano — on how the state should hold students and educators accountable. Ms. Shapiro staunchly supports moving forward with the testing standards in H.B. 3, the 2009 legislation that set up the transition to the new Staar exams from the state’s current TAKS subject area tests . H.B. 500 makes significant modifications to H.B. 3, with the goals of reducing costs and easing districts’ concerns that the new testing regimen could lead to large numbers of students failing to graduate. Instead of the end-of-course Staar exams counting 15 percent of a student’s final grade, H.B. 500 permits school districts to set their own policies. It also would allow districts to suspend a new requirement that students receive a cumulative score on 12 exams in four subject areas to graduate; instead, students would have to pass a total of four exams, one in each subject. To some extent, the divide between Mr. Eissler and Ms. Shapiro is a rehashing of an old battle between the House and Senate on student testing. “This is basically a fight we had two years ago in conference committee, when the Senate wanted the standards as they are on the books today, and the House wanted relaxed graduation standards,” said Andrew C. Erben, president of the Texas Institute for Education Reform, which opposes Mr. Eissler’s bill. Mr. Eissler told his colleagues that his bill represented the “middle ground” between those who want a delay of the Staar tests and those who want to hold firm. On Friday, he acknowledged he had “some missionary work” to do in the Senate. Jake Silverstein and Nate Blakeslee that asks the question “Is public education in Texas doomed?" "In Kansas, for example, a school district just this month got a first-of-its-kind waiver to use its own standards and tests, opting out of state exams for its oldest students. In Utah, the state in March won approval to let 12 districts use computer-adaptive tests for accountability purposes—a request rejected in 2008 by Ms. Spellings." A lack of transparency on these is an issue. AUSTIN — House and Senate budget-writers may be billions of dollars apart when it come to how much they are looking to spend on state services, but they are looking at the same accounting maneuvers to help fill part of a massive revenue shortfall. Two big-ticket revenue items match those backed a day earlier by House budget-writers: delaying the state's payment to schools just long enough to push it into the next fiscal cycle, freeing $1.8 billion, and speeding up tax collections to get more than $1 billion. Sen. Dan Patrick, R-Houston, voiced concern over speeding up business-tax payments, contending it would be a "disaster for small business" because companies will have to pay even if they have not yet collected the money. Duncan said the proposal has been vetted, noting that House budget-writers had letters of support from business groups. The list in Senate Bill 1811 also includes smaller items that could create a flap, such as changing the way little cigars are taxed, so the levy is equivalent to that on cigarettes. That would bring in $25.1 million. The bill also would eliminate a sales tax exemption for those who have long hotel stays, raise the customs brokers' stamp fee, sell under-utilized state property and have unclaimed property revert more quickly to the state. The last item already was OK'd by House budget-writers. Unlike the measure approved by the House Appropriations Committee, the Senate measure does not contemplate the elimination of the annual back-to-school sales tax holiday. In addition to the nearly $4.2 billion worth of items listed in the bill, Duncan said the state can get another $593 million from items that do not require changes in law. The Senate Finance Committee is expected to vote on the bill today, along with other measures to help pay for a spending proposal expected to substantially exceed the House-backed budget proposal. A favorable vote will send the legislation to the full Senate for consideration. The $164.5 billion House budget for the next two years would cut $23 billion from current state and federal spending, a 12.3 percent reduction. House Appropriations Committee Chairman Jim Pitts, R-Waxahachie, said when the House passed its budget that he would work to add funding to key areas, including education and nursing-home rates. He said he thinks the House could add between $4 billion and $5 billion to its plan, but that the Senate plan would be too expensive. The full House could take up its revenue legislation, which amounts to more than $3 billion, next week. The state is facing a budget shortfall of $15 billion to $27 billion through the next two years. In a victory for Gov. Rick Perry, the most recent congressional budgetary stopgap — passed Friday night to avoid closing the federal government — contains language that repeals the "Save Our Schools" amendment from U.S. Rep. Lloyd Doggett, D-Austin. The measure would have prohibited Texas from using federal dollars to replace state funding of schools. Last summer, Doggett and other Democrats in the House supported an amendment to a bill allocating $10 billion in federal funding for education that said Texas couldn't use its portion — $830 million — to supplant rather than supplement state public education money. Because Perry refused to guarantee future funding without the permission of state lawmakers, the Department of Education denied the Texas application for money. In a Jan. 10 New York Times letter to the editor, Doggett wrote that he worked to pass the measure because Perry and state lawmakers used $3.25 billion in federal stimulus dollars marked for education to replace state funding for schools in 2009. In an emailed statement today, Doggett said that the repeal was "one of many unwise concessions" to Republicans to avoid the government shutdown. He also noted that the state Legislature — where budgets from both the House and Senate already include the money — could still achieve the amendment's original purpose if it avoids using money to replace state funds. The Texas congressional delegation, divided along party lines, has quarreled about the amendment since its passage. All 22 of the state's GOP members, led by U.S. Rep. Michael Burgess, R-Lewisville, signed on to a repeal bill earlier this year. Republican Sens. John Cornyn and Kay Bailey Hutchison introduced a similar bill in the upper chamber, and Texas Attorney General Greg Abbott, a Republican, filed suit to get the money without the strings attached. In his February State of the State address, Perry referred to Doggett as "a certain Texas congressman who singled out our state for punishment in pursuit of his own agenda." Cornyn praised the latest development in an emailed statement, calling the original amendment an "untimely political stunt." Removing all accountability on Gov. Perry's use of $830 million of federal aid to education by repealing the “Save Our Schools” Amendment is one of many unwise concessions made to Republicans to avoid their threatened government shutdown. If this federal money is added to the funding for our schools contained in the state Senate Finance bill, our purpose can still be achieved. If it simply replaces proposed state funding, then the concern of state educators, who sought our amendment, will be justified. Our sole objective has remained to ensure that federal aid to education actually aids local Texas schools with additional help rather than being diverted by the state as occurred in 2009 with $3.25 billion of federal aid. The Governor and the Legislature still have the power to do right by our Texas children. The value of academic research became clear to former National Security Agency chief Adm. Bobby Ray Inman, now a professor at the University of Texas' LBJ School of Public Affairs, on March 18, 1983. He was heading the Microelectronics and Computer Technology Corporation, a new consortium of computer and semiconductor companies, and was looking for a place to locate. He recalls that 57 cities in 27 states bid for the company. On that particular day, Inman and others with the consortium were in Chicago to hear pitches by cities from six states. Texas was one of the later presentations. Inman says the Austin Chamber of Commerce representative went on almost too long. He was saved by the presentation that followed: a professor of electrical engineering from UT who talked about the research he was doing on what is now the J.J. Pickle Research Campus. The CEO of one of the semiconductor firms leaned over to Inman and remarked that he’d particularly like to hire students who worked with such a professor. “That’s when it first really came home to me that what really attracted industry was the potential of access to students who had come through superb programs,” Inman says. Ultimately, Austin was selected as the location for MCC, and other corporations soon followed suit. 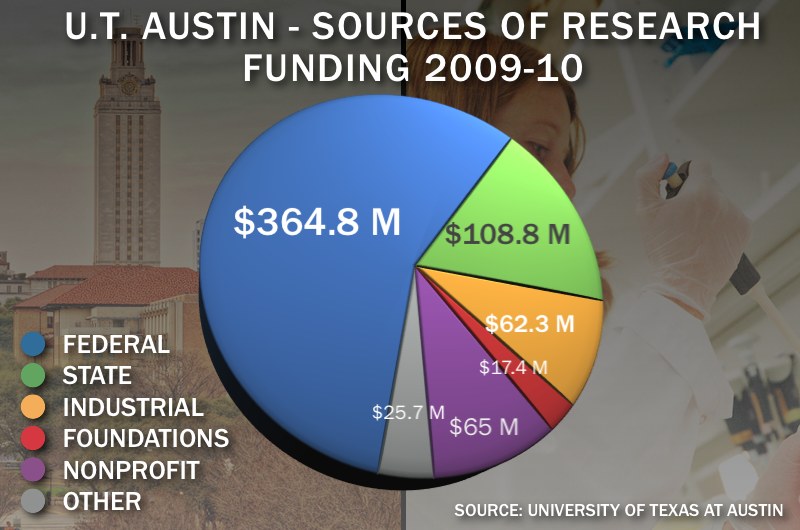 Today, at UT and in higher education around Texas, academic research is under fire — or at least it is perceived to be by prominent members of the UT community. Along with some lawmakers, they have expressed concern about the influence — at the UT System Board of Regents and elsewhere — of the Texas Public Policy Foundation, a conservative think tank that advocates emphasizing teaching over research at universities. Academics and top university administrators, meanwhile, have argued that research and teaching are inseparable. Nobody has questioned the value of teaching, of course, but sensing that research is threatened has sent the community into high alert. The funds that sponsor research can also be key sources of financial support for faculty and facilities. And some argue that the benefits of research extend beyond the bounds of the university campus. According to UT spokesman Don Hale, research activities at the university have a $1.9 billion impact on the state’s economy annually, accounting for a total of 10,500 jobs. Despite the dramatic tenor of the current conversation, publicly there appears to be near unanimity in support of the broad concept of academic research, especially as it relates to the business environment. Drilling down, though, into specific types of research reveals a deeper split. However, he added, “I also am unafraid to look at the data, ask hard questions around productivity, cost-benefits and accountability because I think it is possible to measure the value of research to our common weal." It’s not exactly the sort of thing that attracts major corporations to relocate to Austin. But author Daniel Hamermesh says, “I think it’s very, very relevant. I would defend it to the hilt.” It actually quantifies beauty’s benefits, notes the differences for men and women, and observes how these effects work in markets, including the labor market and the market for spouses. Hamermesh notes that French President Nicolas Sarkozy and Nobel Prize-winning economists like Joseph Stiglitz have advocated for including happiness as a measure of countries’ success — a practice his research calls into question. The gender gap in faculty pay cannot be explained completely by the long careers of male faculty members, the relative productivity of faculty members, or where male and female faculty members tend to work -- even if those and other factors are part of the picture, according to research being released this week at the annual meeting of the American Education Research Association. When all such factors are accounted for, women earn on average 6.9 percent less than do men in similar situations in higher education, says the paper, by Laura Meyers, a doctoral candidate at the University of Washington. The finding could be significant because many colleges have explained gender gaps by pointing out that the senior ranks of the professoriate are still dominated by people who were rising through the ranks in periods of overt sexism and so are lopsidedly male, or that men are more likely than women to teach in certain fields that pay especially well. Meyers found not only that gender-neutral characteristics do not explain away the gaps, but also that they may play out in some ways that benefit men more than women when it comes to faculty salaries -- even for women who are on similar career trajectories to men. A few other studies, praised by some and doubted by others, have also found pay gaps after adjusting for a range of factors -- and the Meyers work may add credence to them as well. Meyers based her research on the 2004 National Study of Postsecondary Faculty, which includes extensive data on faculty members at two-year and four-year, public and private (nonprofit) colleges. Of all the faculty members in the survey, women earn an average full-time salary of $56,100, more than 18 percent less than the male average of $68,900. Some of that gap is explained, Meyers notes, by the sorts of factors that have been used in the past to explain disparities. But her paper notes a variety of situations where men and women do not appear to fare the same financially -- even with comparable levels of experience, institutional homes and disciplines. For instance, part of the gap is explained by women being more likely than are men to teach at institutions that value teaching over research -- and pay favors those at research universities. But women gain less of a pay bump than do men for working at research universities, even when controlling for other factors, Meyers found. This leaves women "essentially at a loss when trying to improve their salary through research orientated positions," she writes. By using information in the database about how faculty members use their time, Meyers also suggests that some activities that both men and women perform seem to have different results. For instance, men who spend significant time on professional service activities that are not based at their institution (say, working with a disciplinary group) do not see any negative impact on their salaries. Women, however, see a consistent, negative impact on their salaries from similar contributions to their professions. Meyers argues in the paper that the presence of unexplained pay gaps by gender -- and of differential treatment of men and women who make similar choices about their careers -- should be cause for concern. "Understanding and responding to gender wage gaps in the academy is critical for policymakers who are interested in ensuring that all faculty members are compensated in an equitable manner," she writes. "That fact that female faculty continue to experience a wage gap even after controlling for disciplinary and institutional characteristics, individual factors, human capital, principal activity and demographic factors is problematic. Faculty members should not be paid differently based on their gender." PHILADELPHIA -- As national and campus debates about student learning outcomes and now college completion have intensified in the last several years, faculty groups and individual professors have largely weighed in from the sidelines, rarely stepping into the actual fray. Whether that's because they have chosen not to participate, or because the policy makers and politicians leading the discussions have not sought to involve them, is a matter of debate -- and both are probably true. AFT Higher Education, the division of the American Federation of Teachers that represents more than 200,000 college and university instructors, professional staff and graduate students, hopes to change that state of affairs with a new effort aimed at injecting its members (and professors generally) more directly into national and campus discussions about how, and how successfully, colleges educate students. The campaign, which was formally begun at the group's national higher education issues conference here this weekend, included the release of a report, "Student Success in Higher Education," a summary of focus groups with students, and a session in which the group's members discussed the reports and the faculty role in student success with several national experts on learning. In the coming months, AFT plans to step up its discussions with national groups and foundations that are working on student success issues and to provide funds to local affiliates to help them with student learning initiatives on their campuses. What is AFT doing stepping onto a minefield that seems to have little to do with the bread-and-butter wage and working-conditions issues on which it and other faculty unions have historically focused? Sandra Schroeder, president of AFT Washington (State) and chair of AFT's Higher Education Program and Policy Council, acknowledged that AFT has long ceded such terrain to campus faculty senates. And while it's an obvious understatement to say that AFT and other unions have plenty of wage and work place issues to worry about right now (see related article), Schroeder said that the union's leaders know that their whole reason for "trying to keep our profession intact" is its underlying purpose -- educating students -- in which they believe deeply. The union has chosen to get directly involved, said Lawrence N. Gold, director of AFT Higher Education, because as conversations about student learning outcomes and college completion have intensified (often without meaningful faculty involvement) at the national, state and campus levels, "so much of what our people hear is off-course." Among the flawed ideas, as Gold and AFT see them: calls for nationally standardized measures of student learning, for tying state funding to seriously flawed measures of graduation rates, and for significantly increasing the number of Americans with college credentials without sufficient concern for the quality of those degrees and certificates. Tempted as many rank and file faculty members might be to respond to what they see as flawed assumptions by fighting back or withdrawing from the conversation entirely, that strategy ultimately does not serve professors or their students well, AFT officials acknowledge. Professors' constant naysaying about efforts to assess student learning allows critics to write them off, fairly or not, as not caring about students -- not a helpful political posture at a time when anti-faculty sentiment appears to be on the rise. 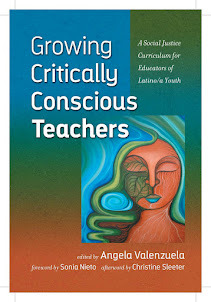 And perhaps more important, the AFT report states, "a lot of what goes wrong with so many curriculum, teaching and assessment proposals is caused by the fact that classroom educators -- along with their knowledge of pedagogy and experience with students -- are not often at the center of the program development process. The perspective of frontline educators should assume a much more prominent role in public discussion about student success and about the most appropriate forms of accountability for assessing it." No one reading the AFT's statement on student success will mistake it for the report of Margaret Spellings' Commission on the Future of Higher Education or other missives that focus on student learning measures as an accountability tool or urge colleges to produce more graduates with fewer resources. The document is threaded, for instance, with warnings that colleges and professors will be unable to educate more students -- and to give them a meaningfully substantive education -- unless public investment in student financial aid increases and state disinvestment in public higher education ceases. "[T]oo many policy discussions of student success avoid serious consideration of financial factors, as though investment in learning is not connected to student success," the AFT report says. "Paying for college is just about the biggest obstacle [students] face in completing their studies. Concerns about finances also lead students to work too many hours, which hampers their chances for success. Finally, students report that large class sizes, limited course offerings and difficulty in getting enough personal attention from overworked faculty and staff are key obstacles to their achievement." Elsewhere in the document is an even more direct assertion that the decline in full-time faculty positions and the lack of support given to their part-time replacements seriously hampers student progress. "A real and lasting solution to the problems of college student retention and attainment will not be achieved without greater government support," it states. Or this: "Government has an obligation to hold institutions accountable for achieving demonstrably good results -- our members believe this very strongly." The AFT report's endorsement of "longitudinal tracking of students as they make their way through the educational system and out into the world beyond" is likely to jolt observers who believe that faculty members do not want to be held accountable. And the AFT's own attempt to define the "elements of student success" -- the knowledge, intellectual abilities and technical skills that students should accumulate as they move through a higher education -- bears a striking resemblance to the Degree Qualifications Profile that the Lumina Foundation for Education released in January (and that a top Lumina official, Holiday Hart McKiernan, discussed with AFT members at the conference Sunday). McKiernan strongly praised the AFT report, noting that Lumina officials believe that a successful effort to increase the number of Americans with high-quality higher educations could not succeed without the full cooperation and involvement of faculty members. Other national figures in the student learning outcomes conversation also welcomed the AFT initiative. Peter N. Ewell, a vice president at the National Center for Higher Education Management Systems, had several criticisms of the paper itself -- he questioned the link between institutions' resources and their student learning outcomes, for instance, noting great variation in the performance of colleges with similar per-student expenditures. But Ewell called the AFT paper a "very constructive sign of engagement," and said it was a "very positive development to see a faculty union wanting to be cooperative." "I think this is a sincere effort by AFT," Ewell said. George Kuh, project director of the National Institute for Learning Outcomes Assessment, said the paper is "largely a summary of what many other knowledgeable people have been saying," and breaks little new ground. But the fact that it comes from a group that represents faculty members who have often been (or been viewed as) recalcitrant about assessing learning is noteworthy, he said. "It's a clear attempt to bring its membership along to think more deeply and in more meaningful ways about student learning," said Kuh. "It is pretty clear that AFT leadership thinks its members need to be doing more, and when a membership organization wants its membership to do something, there's a challenge. If you're too strident in tone, people may walk." AFT appears to have struck that balance well, Kuh said. "It speaks to its membership from an authoritative, informed and responsible position." Judging by the audience's reaction during Sunday's discussion about the report, AFT appears not to have gotten too far out in front of its members, as no rotten tomatoes (or even harsh words) flew as AFT officials described the student learning initiative. But lest anyone think that the rank and file AFT members are ready to join forces with the Bill & Melinda Gates Foundation's push for greater faculty productivity, audience statements during the Q&A session (in which questions were few and far between) quickly revealed otherwise. "Students are coming into our institutions with no skills -- they can't read, they can't write," said a faculty member at one Pennsylvania community college. Another noted the success that his institution's federally financed TRIO program had had in retaining significant numbers of academically underprepared students -- as well as how expensive the program was, and therefore difficult to expand. "If there ain't no money on the table" to accompany the demands for greater student outcomes, he said, "we can't get this done." A week ago, a friend shared a video with me of a school superintendent giving a fiery speech at a Save Texas Schools rally. That is how I met the superintendent of Perrin-Whitt School District, John Kuhn. After watching this video, I felt I had to get to know this man. He responds to my questions below. Question: You have become widely known due to your Letter from Alamo. Can you explain the circumstances that led you to write this? A Texas state senator spoke to a group of administrators in Austin back in February. It just so happens that this senator is the chair of a couple of very important education-related committees and is a former school teacher. As a result, she is kind of seen as an "education expert" among our legislators. This particular senator, however, has been at the forefront of drafting policies that I see as counterproductive for our public schools: she has pushed for more and more high stakes testing, and less and less funding. She also has advocated for maintaining the Target Revenue System, which is a school funding scheme in Texas that gives certain schools more funding than others, seemingly at random. In Texas, the luckiest schools have a Target Revenue of $12,000 per student and the unluckiest schools have a Target Revenue of $4,000--but all schools are held to the same hard-and-fast standards when it comes to state and federal accountability measures. It's unjust on the face of it. So, going into this meeting, I was already angry about the moral underpinnings of our whole system. It just all seems like a parody of bad government to me, like something you'd read in a dystopian novel like 1984 or A Brave New World--except that it's real. So this senator spoke to us and, after letting us know that there will be severe funding cuts due to the economic downturn--and never once mentioning the 2006 school funding tax swap that she and her colleagues adopted which capped property tax rates and slashed 1/3 of schools' revenue, replacing it with a business tax that generated billions less than what was cut (and which was labeled at that time by our state comptroller as "the biggest hot check in state history")--she then began to talk about a pet project of hers: the new State of Texas Assessment of Academic Readiness, or STAAR test. She spoke about it with a gleam in her eyes, as though it were her new grandbaby. And then she said a word that pushed me over the edge. After having spoken at length about making hard decisions and sacrificing and cutting local budgets, she bragged that spending on STAAR was "non-negotiable." Teachers' jobs are on the line, but not the precious test. I had trouble getting on board with her priorities. She took questions at the end of her presentation, and I let her know my concerns. I pointed out to her that I had given myself a 10% pay cut and would be cutting positions soon, and I asked if anyone at Pearson (the firm that makes the test) would be taking a pay cut. I told her she was "saving the test but not the teachers." Her responses to my (probably impertinent) questions left me even more concerned and frustrated than I had already been. Anyway, this particular senator has been a steadfast critic of public schools, calling us inefficient and creating layer upon layer of bureaucracy to watch over us and micromanage everything we do. This session she has often repeated a dubious statistic about the "1-to-1 ratio" of teachers to non-teachers in Texas schools, and how that ratio was 4-to-1 back in the 1970s--never mind the fact that a.) the state's statistics in the 1970s didn't include lunch ladies, bus drivers, and other non-teachers, creating a false comparison, and b.) the amount of bureaucratic nonsense and inflexible accountability measures piled on Texas schools beginning in the 1980s has created countless man hours of reporting and testing paperwork and has led schools to hire testing coordinators, math coaches, parent involvement coordinators, etc. When this senator implies that the state of Texas is broke because superintendents like me just go wild hiring unnecessary non-teachers, it feels very much like I'm being slapped for doing what the senators forced me to do. I feel like public school officials are the Official Scapegoat of Texas. So, in short, I got my belly full. I went back to my hotel room that night and wrote the Alamo letter. I have written a million rants about government insanity in guiding educational policy over the course of my career, but I have always deleted them after venting. But not this time--I typed that bad boy out and sent it to my hometown paper and to Diane Ravitch, to heck with it. And it ended up on Valerie Strauss's blog at the Washington Post website. Then I spent about three nights not sleeping and asking myself, "What have I done?" But, even as I was pretty sure I was going to die from a heart attack over the near-certainty I would lose my job, I was kind of glad I had taken the things we school people gripe to each other about and put it out there for everyone to read. A wise superintendent friend once told me that teachers who complain to each other in the teachers' lounge don't really want things to change, they just want to gripe; but those who want things to be better will actually voice their concerns to the people who have the ability to fix them. So that's why I wrote the letter--I'm begging our legislators to quit driving us down what I believe is the fundamentally wrong trail. So of course teachers are going to teach to the test, and even more so when those scores are tied to them personally (coming soon to a Texas public school near you!) As we move forward, I see the electives withering on the vine and the classroom increasingly becoming a place where kids work on "fundamentals" like they do on the football practice field--after all, that high-stakes test IS the big game, and the consequences of losing are very real. Question: What do you see as the positives and negatives of current education reform efforts in your state and across the country? First, I am not against accountability, just the incredibly convoluted, inefficient, and mean-spirited kind of accountability we have right now. In my mind, we should treat teachers the way we want them to treat students. But we don't. We ask them to encourage and remediate and support kids while we whip, label and threaten them. So the positives would have to be that teachers work hard (which they always did anyway in the rural school I grew up in), and that the top-down pressure has led schools to align their curriculum and really look at what they are teaching. The negatives are huge, however. First, accountability has narrowed our focus down to--in Texas--just four subjects. It doesn't matter to Texas if kids learn anything in any subject but math, science, social studies, and language arts. Therefore, the only saving grace in the arts and foreign languages and vocational classes and athletics is that we have passionate people teaching those subjects who really care about their students and their subjects. And that is the core of my disdain for this ugly baby called accountability--if the test-and-label philosophy really worked, then you would think there would be far worse teaching going on outside the core classes, but there isn't generally. Why? Because good teachers are motivated by passion and a moral sense of mission, not by the threats of absent bureaucrats. We are putting the wrong fuel in our car--it runs best on support, and we are gassing up with intimidation and blame. We are going to burn up this engine by making education a place where only hyper-competitive type-A individuals can feel comfortable, while all of those wonderfully kind and dedicated, supportive people who were born to teach abandon the classroom in search of a kinder profession where their skill sets are valued. The other major gripe I have is this: if we really believed that accountability works, wouldn't we have accountability for all public servants? Why do we not require our legislators to make "Adequate Yearly Progress"? We have the data from their congressional districts, do we not? There is crime data, health care data, poverty figures, and drug use statistics for every state and federal legislative district. Why, exactly, do we not establish annual targets for our legislators to meet? We could eliminate 100% of poverty, crime, drug abuse, and preventable illness by 2014! Question: You seem unusually outspoken for an administrator. Have you experienced any repercussions? My community and school board have supported me, and educators around Texas--as well as nationally--have emailed, called and written letters of support. It's been inspirational. I have received one letter expressing disappointment that I spoke at the Texas Rally to Save Public schools. There have been a few vicious comments posted in the comments sections of articles about the Alamo letter, but I don't take anonymous commenters very seriously. One superintendent indicated in an interview that he felt my letter was inappropriate--he's probably right, but appropriate behavior is what got us here. My contention is that quiet meetings in legislators' offices with frustrated school people asking for support has gotten us the current Rube Goldberg systems. I personally want the general public to be aware of these machinations and the back room legislative wheeler-dealing that gives rise to clearly immoral and self-defeating policies such as the Target Revenue System. I can't bring myself to believe that the average person wants a standardized-test-centric, blame-the-teachers-for-all-social-ills education for their kids. I am tired of educators' silence allowing the public to blindly criticize teachers and local schools for the effects of elected officials' foolish decisions. If elected officials want to play the blame game--and boy do they!--then I'm going to play it with them. There is enough blame to go around. Question: How do you weigh the decision to speak out in this way? I say what I believe to be true. And I'm willing to live with the consequences. Question: Feel free to extemporize if there is something more you would like to share that I have not asked. I have always believed that if a person has the audacity to accept the mantle of leadership, they'd better have the courage to lead. Unfortunately, many of my state elected officials play games and issue half-true sound bites rather than exhibiting true leadership. The greater good is dying on the floor while they preen and play to their fan clubs. (They use the word "constituents" because it sounds more grown up than "fan clubs.") It's all very sad to me, because historically we did education right, and now American education is writhing in hideous deformity on the experimenters' table while other countries do it right. And it's a vicious cycle: the more they mess things up, the more eagerly they then come at us with more clumsy surgeries to "fix" us. I would like to note an incident that gave rise to my speech in Austin. Following the publication of the Alamo letter, I was invited to speak at a college here, and I spoke just before a nationally-known school reformer who is a high school principal. So he spoke about how he got miraculous results in his school, and how 100% of his students went on to four-year colleges, etc. It was all very inspirational. And then, in the middle of his speech, he felt the need to say, "I don't work at a charter school, either. I work at a public high school." The implication was clear--he plays be the same rules as public school principals, he just gets better results. We all play the same game, he's just a better coach. So I was troubled when I got home. I was a public school principal for several years, and I couldn't get 100% of my students to graduate, much less go to college. And I worked hard! What was he doing that I didn't do? So I went to his school's website and I saw an interesting button on the home page. "Apply now!" it said. Weird, I thought. Nobody "applies" at my school. So I clicked on it and discovered that his "public" school is actually a "public magnet" school. He strategically left out that important detail in his speech. You have to apply and be accepted to get into his school; you only have to breathe and live in the district to go to my school. If you don't toe the line at his school, this golden child principal will--wait for it--send you back to the public school! He drafts his players and I play with the Bad News Bears over here, and then he sticks his chest out and tells us all what a skilled coach he is. In short, he deliberately, calculatingly lied by omission to an unsuspecting audience. And that's when I realized that the school reform movement is populated by self-promoting snake oil salesmen, and our elected officials are buying their tonic by the truckload. It's hard for me to watch this train wreck slowly unfold. The narrative of the school reformer is a simple formula: kids are victims, teachers are the villains, and some administrator is the messianic hero. A dynamic personality comes into a bad school and doesn't accept mediocrity. He or she cleans up the discipline and fires all the bad teachers, confronting the wicked teachers' union along the way. The hero is this lone special individual and the administrative mechanisms the he or she put in place. It is, basically, the Heroic Ballad of the Bureaucrat. It sells books and dupes legislators. It makes people rich. It only requires a certain amount of arrogance and duplicity to pull it off. It relies on the same dangerous logic that tyrants use to justify lording over peasants and restricting their liberties. In this case, the benign dictator is a self-promoting principal or superintendent with all the answers, and the poor clueless peasants in dire need of a paternalistic leader are the teachers. The narrative I cling to is also simple, but it doesn't make anyone rich. It would also make for a remarkably boring book. In my ballad, kids are still the victims, but bureaucracy is the enemy. Legislators too afraid to accept responsibility for the persistence of poverty, crime, poor health care, and methamphetamine addiction are the villains, eager only to place blame and not willing or able to actually fix things. And the passionate, beleaguered teachers picking up the pieces in their classrooms day after day are the heroes. My story plays out over years, with a million tiny acts of heroism, each one too small on its own to matter much--but when all of them are put together, how they speak powerfully of a life well-spent! These are the teachers I am sticking up for. And my story doesn't have a Hollywood ending. 100% of my kids don't go to a four-year college. Some of them become house framers or work for our local oilfield companies. But they grow up and raise families and go to church and serve on the school board. They are successes in every sense of the word. And there are others who aren't. Some of my students have gone to prison. Some struggle with addiction. My ballad isn't tidy. But, the nice thing is, I don't have to leave out inconvenient details when I sing my ballad. The assumption that the school reform movement doesn't permit negative outcomes requires you to believe that they fix kids when the hard, unmentionable truth is that they cull them. And I take the culled ones and do the best I can with them. And I'm good with this arrangement because you can't spin the story when you stand before God. God sees through the omissions and knows that the reformer above runs a magnet school and that I take all comers. He can convince the politicians and his readers if he wants to. I'm good with that. I'll soldier on. This is a sad day for Texas. Go to the actual link and check out the comments. House Bill 1, a spartan $164.5 billion two-year budget measure, sailed through the Texas House Sunday on a preliminary vote of 98 to 49 that broke largely along party lines. The Republican majority rolled over the Democrats to approve the 2012-13 budget, which will spend $23 billion less than the current budget and institutes deep cuts to education, social services and essentially every area of state government. Senators have been working on their own version of the budget, which was as almost as lean as the House bill at the beginning of the session. But they have since taken steps to add at least $10 billion to that plan to mitigate the cuts to public education and Medicaid. The spending gap will be major point of contention with House and Senate appointees meet to hammer out the differences in conference committee. Correction: Two Republicans, Aaron Pena and David Simpson, voted against the bill. An earlier version of this blog said it was a party-line vote. The hunt for education spending cuts is not going well in Austin. House and Senate committees have put proposals on the table, but nothing that's acceptable so far. The Senate, led by Education Committee Chairwoman Florence Shapiro of Plano, started out with $9.3 billion less money available for public schools than what would be required under current finance formulas. The first step seemed easy enough. Budgeters told Shapiro and a finance subcommittee to lower spending by just $4 billion. The rest of the $9.3 billion presumably would come from the ever-elusive "somewhere." Even at that, the plan offered up by Shapiro and the subcommittee is not good enough. While it achieves the $4 billion target for spending cuts, it doesn't fix the inequities that have bedeviled many school districts since the Legislature adopted the spending formula in 2006. If changes must be made -- and, given the state's $27 billion budget shortfall, they must -- the first thing to do is to fix what's wrong with the system. School funding must provide a level playing field for all students. Shapiro's reasoning for not doing so is disappointing: "This is not an equity bill," she told the Finance Committee. "This is a bill dealing with cuts in the system." Some of the committee members disagreed. "When we talk about the provision of education to children," said Sen. Kel Seliger, R-Amarillo, "equity is always an issue." The 2006 school spending law froze school districts at per-student funding levels in effect at the time. Some more money has been added since then, notably a one-time $1.8 billion injection of federal stimulus money for teacher pay raises two years ago. But the finance formula still holds some districts back while giving others significantly more money. For example, data given to the Finance Committee show that, before the planned cuts, the Northwest school district would enjoy a maintenance and operations funding advantage of $1,828 more per weighted student than the Arlington district and $1,748 more per weighted student than the Birdville district. After the formula fixes and other changes pushed by Shapiro, Northwest would still be $1,380 per weighted student ahead. That's roughly $690,000 a year more for a typical elementary school -- enough, for example, to pay more to lure teachers away from Arlington or Birdville or almost any other district in Tarrant County. But as Seliger said, "The aspiration that we have for children in the state of Texas is for equal access to education and the advantages it provides to young people." On the House side, budget writers are still looking for $7.8 billion in education spending cuts or an equal amount of money from "somewhere." At a March 9 Appropriations Committee meeting, Education Commissioner Robert Scott commented on the corner legislators seem to be backed into. Pending cuts could leave school districts unable to reach the education goals -- increasingly rigorous standards and pressure to reduce dropout rates -- that the legislators have prescribed. Even higher property tax rates won't get them there, because state law would limit them to only about half the increase needed to maintain current spending levels. That and the equity issues make the state's school finance system vulnerable to another lawsuit. "I expected litigation last summer and haven't seen it yet," Scott said.